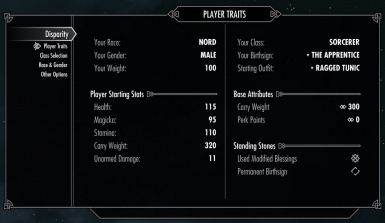 Allows the player to choose a class for their character, adjusts attributes based on race, gender, and body weight, and alters the standing stone blessings. Credit to gamefever for Immersive First Person Combat Items Fix. - Thank you to Tascani for sharing his knowledge on the weapon speed values, and also thanks to renketsu0 for his Attack Speed Mod which provided a great reference for editing attack speed data. - Thank you to slygeezer for all his help with testing the fixes and features in version 2.0. - Thank you to Edghar for his help with the language localization files and for translating Disparity to French. Added Injected keywords for all races in order to support custom races. Added these keywords to conditions on Perks and spells and added support for them in MCM script. Added FISS Support, the ability to create and name custom classes, and save each class as a customized preset. Added options to convert Class and Race starting skill bonuses into Fortified effects. Added two new "body weight" options, Running Speed and Endurance, which favor mid- and low- weight characters. Added new physical damage option for Races. Added new Persuasion option for Females. Added worded class and birthstone descriptions to the MCM. Added changes from Immersive First Person Combat Items Fix by gamefever. This will allow equipped rings, bracelets and other mod-added items to remain visible in 1st person view. Implemented language locatilaztion for MCM. Thanks to Edghar for all his assistance with this. Changed the "Use Modified Racial Abilities" option to reference form lists containing the vanilla racial spells instead of directly referencing each spell. Redid the way the "AttrWeight[...]" spells were added to NPCs, which reduced the number of spells added to the RACE records. Made several adjustments to the Elder Race attributes, so that old people would be consistent with the options applied to other NPCs. Added two new starting outfits to the available options: Skaal clothing and Dark Bloodstained Clothes. Changed Female physical damage modifier from -30% to -25%. Slight rebalancing of the racial/gender speed modifiers. Orc NPCs now use a slightly different version of the Berserk power, which lasts for 30 sec instead of 20 sec to allow the AI a bit more time to utilize this ability. In addition, Orc NPCs now only do +10% melee damage (instead of player's 20%). - Visual and sound effects for the Ritual power have been altered slightly (red instead of blue, slightly different sound effect). - Ritual spell will now only reanimate actors equal to the player's level or lower. - Player must have at least 100 health in order to initiate the spell (the visuals will still play if you cast the spell with less than 100 health, but nothing will happen and no health deduction will occur). - It should no longer be possible for the Ritual spell to kill the player outright, however it may leave you with only a small amount of health remaining as the amount of health deducted increases with the number of NPCs resurrected. If available, 100 health will be deducted for each actor resurrected. If the player doesn't have 100 health for each actor, then a lesser amount will be sacrificed until the player is at about 10 health, then no more health will be deducted. - NPC health bars should now properly reflect an NPC's modified base health value. - Added condition to Damage H/M/S racial attributes so that they won't apply to any actor with less than 30 in that attribute, and specifically conditioned the Khajiit health adjustment so it won't apply to Vasha. - Sound effects have been removed from the Orc Berserk effect. - A couple of script changes that should eliminate unnecessary papyrus log messages. - Ancestor Ghost will no longer turn into lootable "ghostly remains" when it dies. - Ancestor Ghost should now be named "[actor]'s Ancestor Ghost"
- Redguard racial ability (weap speed) is now flagged as an ability rather than a spell. - Selecting a new starting outfit will now properly remove the previous outfit from the player's inventory (though this may still not work if using mods like Live Another Life, which also change the player's starting outfit). - Changed RACE_doomSteedAbility to use visible versions of the effects, so the stone ability will show up in UI effects menu. - Added "IsCombatTarget Player == 1" as condition on Lover Aborb Stamina cloak effect to prevent it from draining followers and allies. - Changed the class attributes for Intelligence and Willpower to use a modified Regenerate Magicka effect rather than the vanilla AbFortifyMagickaRate. The new modified version changes MagickaRateMult instead of MagickaRate, which should now modify the player's magicka regeneration rate by the correct amount. - Carried over a few recent changes from USLEEP and made a handful of various other minor bug fixes. Added small Fortify Health bonus to Vasha (the Khajiit captive during the DB quest) to prevent him from dying. Added conditions to the Orc Berserk effect that should prevent it from activating during a Brawl. Added a dummy effect to the Thief ability so that it will show up properly in the active effects menu. The Redguard racial ability used by NPCs now correctly checks if the NPC is a Redguard. Fixed conditions on quest scenes to allow Hadvar/Ralof to recognize when the player has selected one of the standing stone abilities on the way to Riverwood in the beginning of the game, also skips this dialogue if player selected a Permanent Birthsign. The Aetherial Crown should now work correctly with Disparity's new abilities, as well as with the Permanent Birthsign option. Added condition to prevent Athis from summoning ancestor guardian during JorrvaskrFightScene. Another attempt to fix the Thief "Luck" ability. Added condition to Breton Absorb Spell ability so it will only activate in combat. Added dialogue conditions that would allow Hadvar/Ralof to recognize when the player has selected one of the standing stone abilities on the way to Riverwood in the beginning of the game. Removed the "GetRandomPercent" condition from the 'Modify Recover Arrow Chance' on the Thief Stone (I think this was the cause of the CTD issues). Went through all new spells to make sure the "Disallow Spell Absorb/Reflect" flag was checked where needed. Removed visual indicators from all of the constant abilities. Thief doomstone ability was missing script to change the loot chances. Added new option to select a birthsign from the MCM menu, as well as the option to make your birthsign permanent. Changed conditions on Orc Berserk power to prevent resetting it by sneaking. Added missing Khajiit NightEye Power. Fixed the Class Specializations so they are no longer using the vanilla Mage, Warrior, and Thief spells. They will now be listed correctly in the active effects screen, and won't be removed when you take one of the standing stone blessings. Fixed the duplicate 5% armor bonus that Nords were receiving. Added a couple of conditions to prevent NPCs from constantly spamming ancestor ghosts and prevented the ancestor ghosts from themselves spawning more ghosts. Changed ancestor ghost shader from regular blue ghost shader to ghost fire shader. Removed explosion effect from Imperial Call to Arms power. Prevented the Imperial "Call To Arms" effects from stacking if there were multiple Imperial allies. Added option to adjust number of perk points. Fixed script that applies class settings. Attributes should no longer reset when opening the MCM menu. The changes should also make Disparity work better when used on an existing character. Actually added the Attack speed fix to the race records as intended (this should fix the speed-related issues that have been reported). This mod allows the player to customize their character by choosing a class and specialization similar to previous Elder Scrolls games. It also adjusts starting skills and attributes based on both race and gender to create more diversity among the different races of Skyrim. Choose a class for your character. Class will determine your character's starting skills, attributes, and skill progression. Racial disparity: changes to stats and attributes to create more diversity between the different races. Gender disparity: changes to stats and attributes to create more difference between males and females. Body weight now equals physical strength. Actors who look stronger will now actually be stronger. Modified racial abilities to focus on passive traits. Racial heights have been adjusted to more closely correspond to previous games. Almost all features are optional and can be disabled via Disparity's MCM. Disparity works best when used with a new character. Racial abilities may not update properly when applied to existing characters. If you are not using SkyUI v5.1 or greater, then make sure to download the patch for older SkyUI versions listed in the optional files section. - SkyUI 5.1 is required in order to have the option to re-name the custom classes. - FISS is required if you wish to save your settings and/or create custom class presets. When updating to version 1.45, make sure that the Thief Stone ability is not active (visible) in your active spell effects list prior to saving and updating. If you're updating from Version 1.1 or later, just replace the old files with the new ones and continue your save. If you're updating from Version 1.0, then I strongly recommend starting a new character or else reverting to a save prior to installing Disparity, rather than trying to update from Version 1.0. Before uninstalling: Unlock the class settings, in the Class menu. Make sure you are not under the effect of any of the special racial powers, or revert the racial abilities and standing stones back to their vanilla state by unchecking those options. Then make a new save, exit the game, and delete all Disparity related files. This mod will be incompatible with any mod that alters the RACE records for the playable races. Any mod altering the RACE records for the playable races will need to be patched in order for it to be used together with Disparity. overwrite Disparity and still use Disparity to choose a Class for your character (however, most of the other changes from Disparity will get overwritten). This also means that the class system will still work perfectly fine if you are playing as a custom race. This mod also changes the base actor value for attack speed from 0 to 1 in order to allow this value to work properly when used by various effects, and has corrected the vanilla perks using this value, so they can work correctly with one another. Other mods that alter attack speed may not work properly if they have not also implemented a similar change. If you experience problems with attack speed, then there is an MCM option to disable the attack speed fix, as well as disabling all attack speed changes made by Disparity. 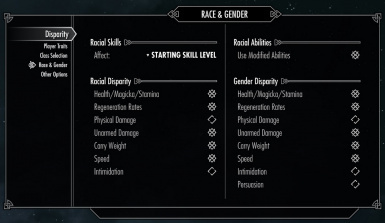 If using another mod that changes the racial abilities by only altering the vanilla spells or magic effects and not by making changes to the race records, then it can be used with Disparity simply by going to Disparity's MCM and deselecting the "New Racial Abilities" option. Likewise, if using another mod that changes the standing stone abilities, but does not alter the actual activator objects (most don't), then you can simply load it after Disparity and deselect the "New Standing Stone Abilities" option. 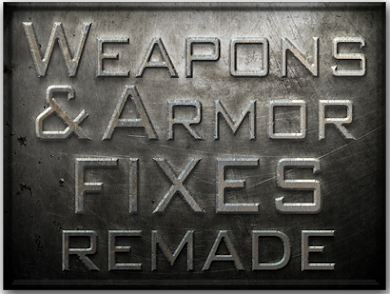 A list of mods reported to be compatible can be found here. slygeezer for all his help with testing the fixes and features in version 2.0. Edghar for his help with the language localization files and for translating Disparity to French (available soon!). Tascani for sharing his knowledge on the weapon speed values, and renketsu0 for his Attack Speed Mod which provided a great reference for editing attack speed data. 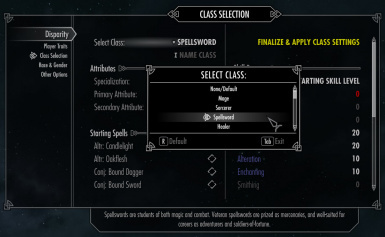 This feature is a throwback to previous Elder Scrolls games where the player was able to select a class for their character that helped to define that character's starting abilities and make each character and play-through more unique. This feature is completely optional, and you can choose to ignore it if you don't want to define a class for your character. After you have selected your character's race at the beginning of the game, then go to Disparity's MCM to select your Class. You can use one of the predefined classes, or you can choose to completely customize any of the classes to create your own desired combination of starting skills and attribute bonuses. Each class is composed of a Specialization, a Primary Attribute, and a Secondary Attribute. Each class also receives 100 skill level points to distribute among the various skills. 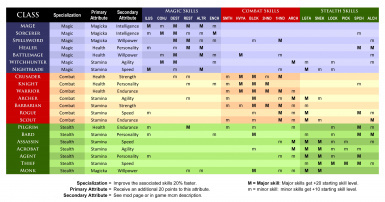 Class-based skill points are generally applied to your character's starting skill level. Optionally, you may choose to allow these skill points to apply to your skill progression, allowing your class's Major and Minor skills to increase faster proportional to the number of skill points awarded to those skills. Once you have made your selection and have the class set up the way you want, you then need to click on Confirm Class Selection in order to apply the class changes to your character. Click here for a more detailed explanation of the new class system. 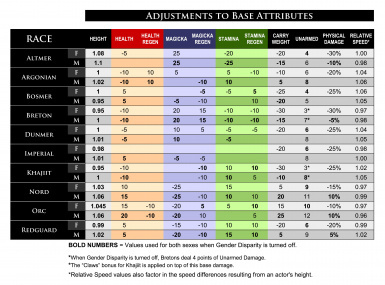 Disparity adjusts many of the base attributes for the playable races. The racial heights and starting skills have been tweaked in favor of values used in previous games. Heights have also been adjusted to add a bit more variation between males and females. Optional adjustments are also applied to each race's base Health, Magicka, and Stamina, their regeneration rates, carry weight, speed, and intimidation chances. With the exception of height settings and racial skills, everything else is completely optional. You can choose which attributes to change and whether or not they should differ by race or gender or both. Almost all settings will apply to the player and NPCs alike. Each race starts with a different set of skills. Every race has been given 45 skill points which are divided among major and minor skills. 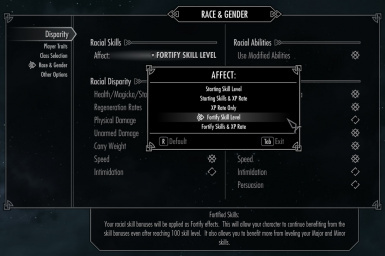 By default, the racial skill specializations only affect the starting skill level. Optionally, you may also have these racial skills affect the rate at which you gain experience in these skills. This option is turned off by default but can be enabled in the MCM. The racial abilities have modified to focus more on passive, innate traits. I don't really care much for the added micromanagement that once-a-day powers add to the game. For me, having to check whether one of my character's abilities is currently available for use always feels like an imposition on the game and breaks my immersion. It just feels like an artificial limitation, particularly for something that is suppose to be an inherent racial ability. So instead I've focused on passive bonuses, and changed many of the once-a-day powers to spells that are autocast when certain conditions are met. If you don't wish to use my modified abilities, you can disable them in the MCM and swap them for the vanilla abilities and powers. 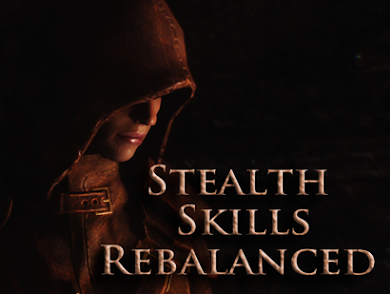 Click here for a list of the new racial skills and abilities. Beyond race and gender, a third option is to vary certain stats based on body weight. This is the value used by the weight slider when you create your character. In the vanilla game, this setting is only a visual difference and has no effect whatsoever on game play. However, Disparity will allow actors who look physically strong to also get buffs related to their physical strength, including doing more physical and unarmed damage, increased carry weight, and increased chances to successfully intimidate others. And, yes, these buffs will adjust dynamically during the game so if you're using a mod like Pumping Iron, your bonuses will increase as your character gains more muscle. Enabling these options will also apply the changes to NPCs. Disparity also makes adjustments to the blessings acquired from the Standing Stones. If you don't wish to use the modified blessings, there is an option in the MCM to revert them back to their vanilla state. 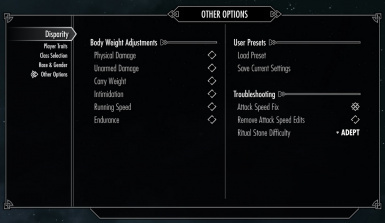 If you wish to use another mod that changes the standing stone abilities, then in most cases, you should be able to simply load the desired mod after Disparity and change the option in Disparity's MCM to use the vanilla settings. Assuming the other mod has made it's changes by editing the vanilla spells, then this should automatically replace Disparity's changes with those of the other mod. PLEASE NOTE: the Class Specializations (Combat, Magic, or Stealth) have the same effect as the vanilla Warrior, Mage, and Thief stones. If you choose to use the vanilla blessings (or those from another mod), then I recommend that you avoid stacking the vanilla Mage, Thief, or Warrior blessings with the corresponding Class Specialization. Click here for a list of the changes made to the Standing Stones.